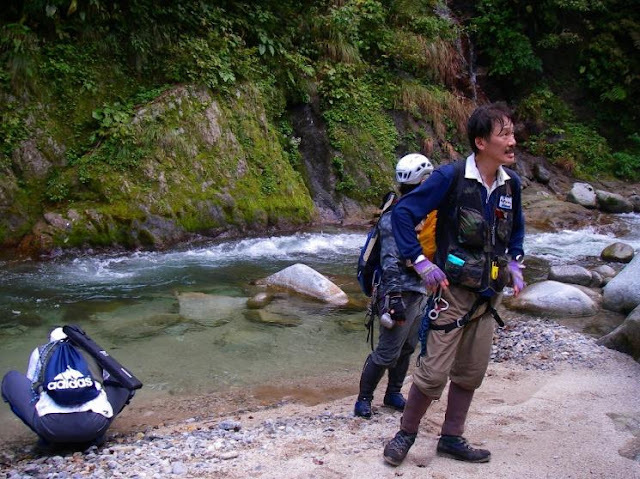 For me, in a small but very important way, Kazuya Shimoda represents my early research into Japanese Tenkara! Soon after Daniel’s introduction of Tenkara to America, I learned much about it from Dr. Ishigaki and Masami but there was little in the way of media here in America. Shimoda-san created Tenkara videos and I watched them, devouring each one looking for my Tenkara. It was through these videos that I learned so much. Move forward a couple of years and I found that Shimoda-san joined Facebook! I could actually correspond with him, share his interests, very cool. I suggested many friends to him through my contacts; in short, I am honored to have earned his acquaintance. I asked Sachen-san, to help me approach Kazuya and together we drafted an introduction so that we will be able to reach a deeper level of friendship with Kazuya Shimoda. I am quite pleased to be able to ask some questions with Kazuya-san. Adam: Kazuya-san, please accept my sincerest gratitude of your showing me Tenkara through your videos. I have learned so much and very early in the American timeline. Your videos helped my love of Japanese fishing in a time where I wanted much more than what was available in America. Each video I watched, I stopped and re-played, over and over. I looked at the small details in your teaching. I would often look at the surroundings of the stream imagining myself fishing the mountain streams of Japan. Although I could not understand your language, I learned a lot from watching. Thank you for making your Tenkara videos available. Kazuya Shimoda: My very first video was not an instructional but was rather a fishing trip diary video titled 「秋山郷・テンカラ釣行」Akiyamago Tenkara Fishing Trip that I produced. The current videos streaming on the internet are works that the publishers and I produced that provide easy to follow and understand instructional videos that focus on visually teaching Tenkara rather than using words. We have been making videos that focus on casting techniques, Keiryu mountain stream fishing practice techniques that are edited down into several segments that allow the viewer to gain a better understanding through watching and listening. In those days there were several instructional books available but I don’t recall any DVDs in the market. It was a time DVD players became a standard appliance in Japan. As your question is asking what my objective was for openly releasing the videos, I must say as the editor posted the content on the internet, my DVD suddenly became widely available and I was very surprised to find out that anglers worldwide have been viewing them. Adam: There a few non-Japanese that regularly produce Tenkara videos. Daniel Galhardo does a great job, Paul Gaskell and John Pearson also make great instructional videos but they are in a different style. Dr. Tom Davis does a good job as well. I believe all of these different styles of Tenkara make us such a great International community. We share a lot of friends on Facebook. You get to see some of the Tenkara interest that we have here in America and now beyond. There are good communities in England, France and Italy. Tenkara now has people in many countries around the world. I want these communities to know about you. Kazuya Shimoda: Original Tenkara fishing was very important in getting a protein source for Japan’s mountain villagers and it began with fishing for Iwana and Yamame fish. These mountain men observed fish jumping for Leaf Beatle insects and then created simple, yet an uncomplicated means for catching fish for the mountain village. Taking a Kebari fly and tugging and floating it in a way to make it appear like a real insect to catch fish in a surreal and fast manner developed into an enjoyable style of fishing. The materials used to make modern Tenkara rods, hackle and so forth are mostly imported from various countries. I think modern Tenkara will not maintain only Japan’s traditional form but will adopt some good aspects of fly fishing and develop into a global form of fishing. I think the developments will come from adoptions from streams and environments from various countries. I am really looking forward to seeing how Japanese techniques are adopted and enhanced outside Japan. Adam: I visited Japan last year and exclusively fished only Tenkara in different areas. During my visit, many times I thought of your videos. My Tenkara has some of your lessons and visuals in it and I appreciate that. I will remember those moments of introspection, thinking of how I was learning and then while I was in Japan fishing, remembering you. I really appreciate what you have done. Kazuya Shimoda: I did not expect that at all. Tenkara origins began as Keiryu mountain stream fishing for mountain villagers that developed into a Japanese form of traditional fishing and has been generally unknown and adopted by very few anglers. 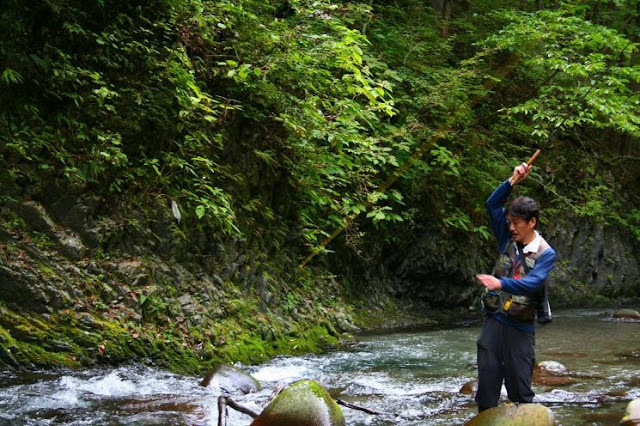 Keiryu mountain stream fishing in Japan differs from streams overseas which are vast and offer peaceful conditions, as the streams here are narrow, the gaps are extreme with huge bolders, waterfalls and dangerous elements with many barriers. It has therefore been critical to have short rigging and pin point accuracy. 17 years ago I was invited by a Russian academy to practice Tenkara in a Russian stream. The mountain stream was radically different from what I was used to in Japan so I became quite confused. I was convinced that the types of fly and lures used outside Japan were not suitable for Tenkara. I am therefore really surprised to hear about efforts being made by Tenkara anglers and their strong passion from various countries. I am really looking forward to observing the direction Tenkara is heading. Adam: In my studies of Japanese Tenkara, I have come across many different authors. Early on I learned about Soseki Yamamoto, Hiromichi Fuji, Kegu Horie, Yuzo Sebata and Hisao Ishigaki. The old Tenkara books that I have far surpass any of the new Tenkara books that are being produced today. Yamamoto-san was very prolific in his writing and produced a lot of Tenkara stories in book form. I particularly like the technique books because of the many diagrams and techniques that have not been widely used in America. But the stories of Tenkara are very interesting too. 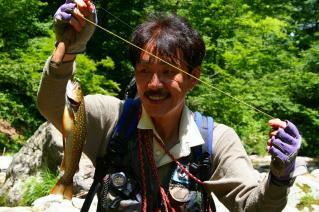 Kazuya Shimoda: I began Tenkara fishing 36 years ago and before that I did bait fishing. At that time it was popular to use bait for Keiryu mountain stream fishing and Tenkara was minor in popularity and only a few Tenkara anglers knew the technique. One of these anglers I know is the one and only Gentatsu Kuwabara who is well known for his book published in 1978 「毛バリ釣りの楽しみ方」Kebarizuri no Tanoshimikata which translates to How to Enjoy Kebari Fishing. I was able to learn many fundamental techniques from this book. I have read many Keiryu mountain stream fishing books. There are a few which has left a strong impression on me and include 「遥かなる山釣り・山本素石著」Harukanaru Yamatsuri by Soseki Yamamoto・「つり師遠山品右衛門・甲山五一著」Tsuri-shi Tōyama-hin Uemon by Goichi Koyama・「渓語り・瀬畑雄三著」Kei Katari by Yuzo Sebata・「風のテンカラ師・堀江渓愚著」Kaze no Tenkara-shi by Keigu Horie. 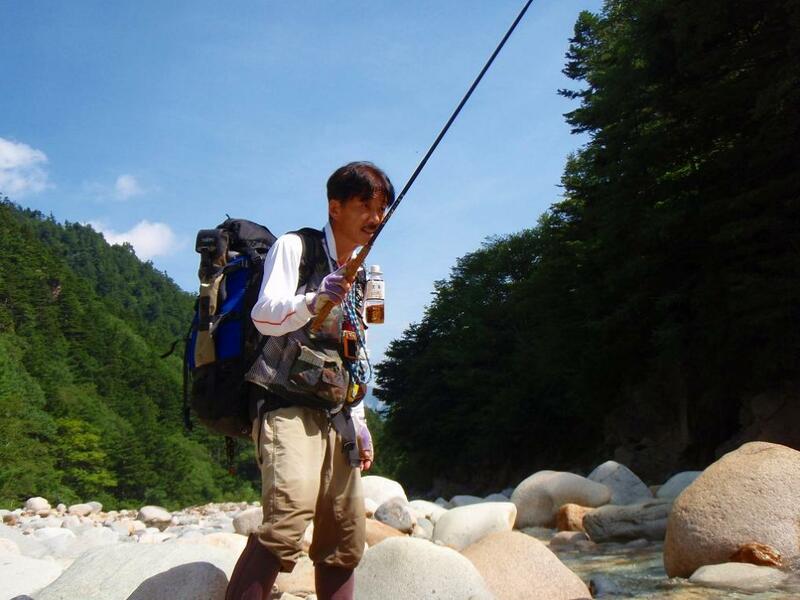 Adam: I have meet many Japanese fly fishers, Tenkara anglers and some Keiryu anglers. Keiichi Okushi has helped me learn all of the aspects of genryu. Now I have made friends with many Genryu anglers from Facebook. Kazuya Shimoda: At the time I began Keiryu mountain fishing I started off in mountain village mid stream locations. I fished for native Iwana in unspoiled wilderness and moved on to upper streams and fields. I would search for unseen streams on maps and venture on routes over mountains. I would hike exhaustively with a heavy pack climbing over waterfalls, sometimes having to swim to reach my Tenba (camp site destination). At this point it is necessary to have stream side lifestyle skills. I use a tarp rather than a tent. One must have skills to make open fires, know about Sansai (edible mountain plants), mushroom gathering, how to make use of the riches of mountain soil among other knowledge in order to enjoy a stream side lifestyle. When possible I like to make use of what is available to me at the camping area. By learning to do so you will be able to have a safer and more enjoyable experience on your fishing trips and be able to lighten your load. Making good use of your knowledge, experience and ideas are essential techniques for a stream side lifestyle. Adam: With many of the Interviews that I do, I really enjoy understanding how the person learned how to fish. Kazuya Shimoda: When I was a jazz musician (I played jazz guitar) at the age of 20 I lived in New York for about 2 years. Now 40 years have passed since then but at that time a friend who was a musician invited me to go Keiryu mountain stream fishing which was my first experience. In the beginning I was engaged in bait fishing and not Tenkara. I quickly developed a strong interest in Keiryu mountain stream fishing and spent about half of each month fishing. Since I was a musician I had lots of free time on my hands. As the number of my expeditions increased I made new friends with mountain men who introduced me to Tenkara. I began by imitating what I saw. I was taught the fundamental points of Tenkara which include how to approach the fish, floating the Kebari fly, how to avoid my shadow from reflecting in the stream, having a presence which is not noticed by the fish which we call木化け石化け Kibake Ishibake meaning you become the tree or stone in the forest to blend in with nature. In those days there was not much Tenkara equipment available and perhaps only 3-4 types of Tenkara rods being sold. My first Tenkara rod was a short 3.9m bait fishing rod and the tip was broken off to make it fatter for my use. The lines were made with Umamoto (horse tail hair) by twisting it. This was the starting point of Tenkara for me. Materials such as Umamoto horse hair among other things was hard to obtain so equipment was made through repeated trial and error and developed into the style we have today. All original Tenkara lines were woven strands (thread woven by hand) and there were no level lines and such. Nowadays we have rods and level line manufactured by professional craftsman and manufactures which is changing Tenkara from its origin. Adam: Growing up as a child, I watched cartoons and I enjoy the artwork and the story in many of them. Recently, I’ve learned about Sanpei comics and the cartoon TV series. It is amazing. I have learned so much about Japanese fishing through the Sanpei. Kazuya Shimoda: I have watched Tsuri Kichi Sanpei cartoons. The Sanpei cartoon was a big hit in Japan and at one point contributed to a boom in fishing across Japan. I have not watched the movie but I have heard the reviews were good. Kazuya Shimoda: I have been invited by a friend to fish in the ocean and gone on several occasions. 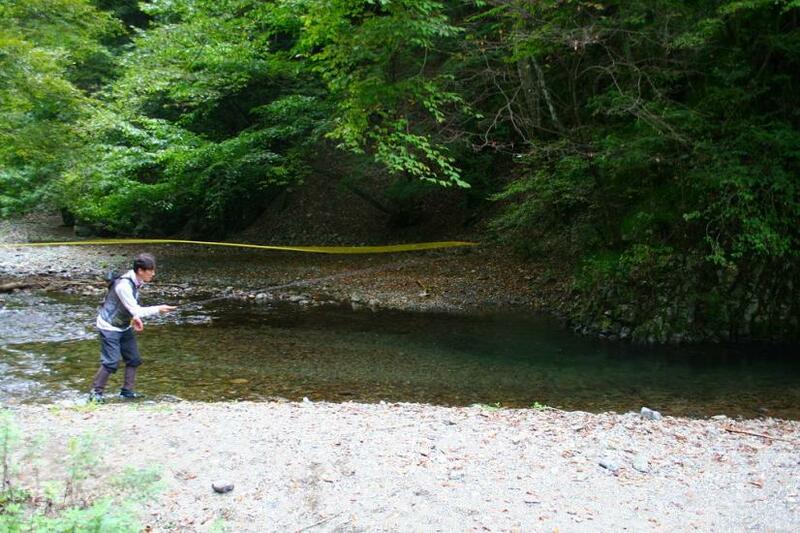 By mentioning Keiryu mountain stream fishing, I have also gone bait and lure fishing on a few occasions. Adam: I am a fly fisher and love fishing for trout in large rivers. I also fish my streamer patterns in the ocean, fly casting them. Here in America, many new anglers are trying fishing with telescoping poles in the rivers and ocean. They learned Tenkara and now they want to take it farther and fish other areas. Kazuya Shimoda: In ancient Tenkara fishing, the line length limits fishing in large rivers, ocean and lakes. To some extent it is possible to fish in wider rivers by standing in the river to extend your reach using longer rigging. Tenkara uses simple Kebari flys, pin point casting and control which utilizes movement techniques. With longer lines the control becomes difficult. Tenkara was developed to deal with narrow streams, big drops and other dangerous conditions which are characteristic in Japan mountain streams. Tenkara fishing targets fish who are ready to eat using simple but effective kebari flys, without standing still but maintaining a good tempo by fishing with your feet (this means not standing in a fixed spot but rather to fish across a long distance while walking) is what I was taught. Fishing techniques and various styles to adopt are a personal choice but I think a reel is necessary to catch big fish. Kazuya Shimoda: Here in Japan I have seen telescoping rods with tiny reels attached using Tenkara rigging, but these have not become popular. As I have never used a telescoping rod with a reel, I really cannot comment on it. I think you should be able to get a good result using a fly without forcedly using a Tenkara rod. A Tenkara rod requires a good balance with the line. It is crucial to have a good conditioned rod and rig in order for me to precisely cast the kebari fly to the target point. This is a very delicate part of Tenkara. I think it is difficult to achieve delicate control with a telescoping rod. Additionally, by attaching a reel, the critical balance is broken. Tenkara should simply have the rod, line and Kebari fly. This is the beauty and attraction of Tenkara fishing. When fishing at the headwater, for the most part there are not large fish. In Japan, large fish are considered to be no larger than the 40-50cm range. With this size of fish, the Tenkara rods and rigging made in Japan are sufficient. I have never considered fishing Tenkara in large rivers, lakes or the ocean. The lines and lures could be used though. Adam: I visited the historic village of Gokayama during my visit. I stayed in a 350 year old home. We had shioyaki and sansai and many other “home cooked” on the irori meals, it was very delicious. 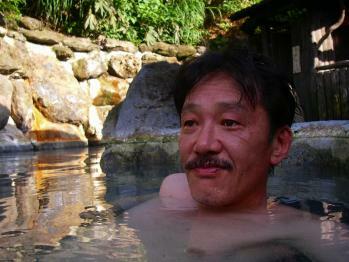 I also stayed in Re-Rise Lodge with Nahuji-san. He guided us in the mountains near Takayama. He collected sansai and prepared it for us tempura style. I love the cooking of my Japanese friends and the style of Japanese meals in general. Kazuya Shimoda: My style is Genryu headwater fishing and since I don’t stay in lodges I use a tarp to camp for several days. My backpack contains a sleeping bag, mat, eating utensils, change of clothes, fishing gear, sake, climbing rope etc and therefore my bag is very heavy. Whenever possible I make use of food sources available at my site. I have knowledge on mountain vegetables, mushrooms etc and I forage for these items which is one of the fun aspects of Genryu fishing trips. Adam: I would like to take it back to some questions about equipment. I have been through around three or four dozen rods personal now. I have limited my quiver to only a few that I really like. Half my quiver is zoom rods; double and triple zoom and the other half are fixed length. Daniel Galhardo’s rods, the Ito and Rhodo are two of my favorites. I also use Nissin rods, the Zerosum and the Royal Stage. I like the longest and lightest level line that I can use. For my little Rhodo which is a triple zoom I use a #2.5 This is my smallest stream rod. My Ito double zoom is for larger or mainstream. The Zerosum and Royal Stage are for specific streams. I like 5:5 and 6:4 for my level lines and stiffer 6:4 and 7:3 for my Fuji type furled lines. Kazuya Shimoda: Even the same Tenkara rods being sold in Japan compared with those sold in various countries use different naming conventions. The rods being sold in Japan seemingly use very complex Chinese Kanji characters that even native Japanese including myself are unable to read on some models. The Tenkara rods you mention Adam are unfamiliar to me and I don’t know the equivalent rod here in Japan. I have received several rods from fishing gear manufactures for monitoring purpose but the one I love and use is a 3.9m, 7:3 action Tenkara rod. The line I have adopted through trial and error results has good visibility and is smooth, works well in wind and is a durable Made in US shooting line 0.31sl. A rod of 3.9m, line of 5m and hackle of 1.5-2m is my standard setup. This length will be adjusted according to the particular stream size and its conditions. If it is a calm stream condition, I sometimes use a fluorocarbon level line with the same rod. Adam: Mountain fishing combines a few things; you have to know about the mountains and moving in them. You have to have good hiking skills and the equipment that goes along with it is all part of good choices in choosing what you use and carry. Kazuya Shimoda: Just as you have mentioned, using lightweight, compact and durable items are a key principle to camping goods, but by adding those this and that convenient items may be nice to have, but they add weight to the pack. The items I always take with me include packing tape, synthetic string, wire, instant adhesive tape and a compact folding handsaw. These items are very useful for back country camping. The synthetic string is used for rigging the tarp and a line between trees for hanging items as well as for general maintenance. The packing tape can be used if the rod breaks or if I get injured or repairing the tarp among many other uses. When camping in the headwaters, I need to be able to care for myself as you never know what will happen. Packing light weight, non-bulky items that are useful is really important. Adam: Besides equipment, choices in who we fish for are very personal. I typically fish alone, I know I can depend on myself to get there and to go fishing. I don’t have to do anything except decide what I want to do. Every once in a while, I enjoy fishing with a friend and if I can fish with someone that likes to fish in the same style or on the same type of streams as I do, then it is even better to share the experiences. I know that you have a cameraman for your videos, so you have at least one other person that goes with you but what about when you are not filming? Do you enjoy fishing with a few friends or just one other person? Kazuya Shimoda: When I am making videos, I travel with a cameraman and usually a porter to carry in the equipment needed for filming. 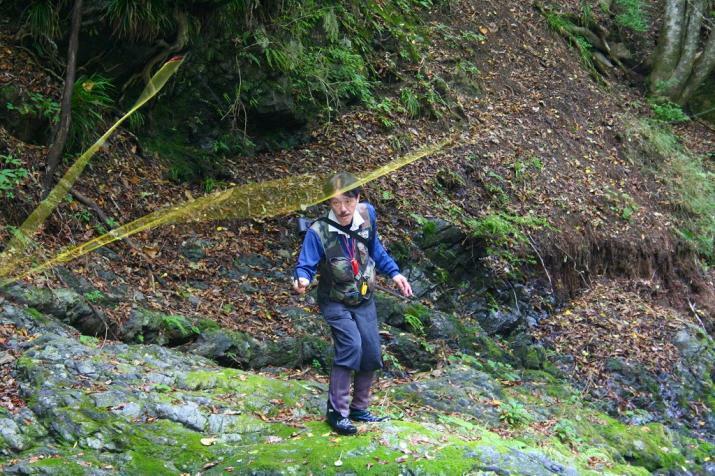 When traveling through dangerous Keiryu mountain stream areas regression techniques (skills for Keiryu, walking through water) and bringing someone who has rope work skills is needed. I was working in the production department of a Keiryu mountain stream magazine. My job was to produce Keiryu fishing instructional books, appear on tv shows about the outdoors, make Tenkara videos, Keiryu guidebooks, introduce Keiryu gear among many other things. The number of people needed for the trips depended on the content and objectives of the videos and coverage. When I was younger, I mainly did Tandoku Choko (fished alone) and went Genryu headwater fishing for several days hiking all around by myself. Over time the number of Tsuri Tomo (fishing friends) increased and I began traveling together with them more often. There is always risk involved when going headwater fishing. By having companions we are able to share the load of supplies of food, ropes and general gear we need to carry. I am an advisor to the Keiryu-Kai, an All Japan Association of Himajin (men of leisure). I will be 66 years old this year. I no longer have the drive to out fish others by catching more fish like I did when I was younger. These days I enjoy Enkai Choko (banquet fishing) with friends I get along with. Adam: I really appreciate your participation and kindest patience with my prying questions. I really want people to know just how cool you are. I like what you do, I have enjoyed learning from you early on with your videos and I continue to enjoy your friendship at Facebook. Kazuya Shimoda: I really never thought Tenkara, which is considered a minority in Japan would become popular among the anglers from various countries. I really respect all of you passionate Tenkara anglers. I believe new forms of Tenkara will develop according to the environments in various counties. In the near future, a day may come where new styles of Tenkara fishing are introduced back to Japan. I am looking forward to that day! Adam: I really appreciate you Kazuya Shimoda, thank you sincerely for helping me from afar.